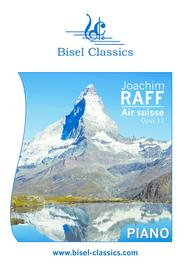 Composed by Joachim Raff. Edited by Nicolas Di Paolo. This edition: softcover. Bisel Classics. Score. With Text Language: English / German. Opus 11. 26 pages. Published by Bisel Classics - Digital (BQ.979-0-50179-161-3). Raff lived an eventful life of ups and down but remained a prolific composer throughout. Towards the end of his life, he had earned a reputation as a respected and important composer and his works were frequently performed in Germany and across Europe. Yet after his death only a few compositions survived in the public consciousness. Recent publications of works from this great composer are proof of a reawakening of interest in a remarkable talent of the Romantic era. Composed when he was just twenty-two, the "Air Suisse" is an ephemeral and emotive depiction of the Alpine setting which may very well have constituted a fond farewell to his homeland as he set out on his grand life journey as a serious composer.